This FREE report outlines 5 crucial components to help you, your employees and your organization, survive an active shooter tragedy. Unfortunately, active shooter incidents are a part of the world we live in. It’s important for businesses and other organizations to understand the threat and come up with an action plan that will help to save lives. How prepared is your workplace? Do you have a crisis management team? Shelter-in-place plans? An emergency notification system? This report “Are You Prepared for an Active Shooter Incident?” addresses these topics along with others. According to an FBI report, in 60 percent of incidents, shootings ended before help could arrive. Therefore, it’s up to your organization to have an action plan in place. 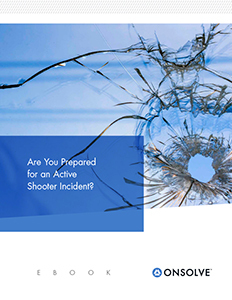 Download this free guide, “Are You Prepared for an Active Shooter Incident?,” to help your business be proactive and put an effective plan in place.